Hotel Pankaj will offer you good lodging facilities with comfortable rooms at a reasonable rate. Indiahotelandresort offers you the facility to book your hotels well ahead in advance. Located on M.G. Road, Hotel Pankaj is one of the preferred three star hotels by tourists who wish to stay at the center of the city. Just 6 kms from the Trivandrun Airport and 2 kms from the Railway Station, Hotel Pankaj is known for its traditional hospitality and efficient staff. While holidaying in Thiruvananthapuram, Hotel Pankaj can be the ideal accommodation to avail. 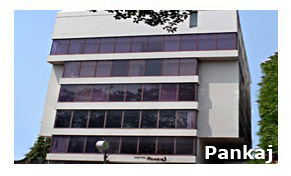 Hotel Pankaj has 52 well-furnished rooms. It has all the modern amenities necessary to make the stay comfortable. The hotel has suites, deluxe and executive rooms. Furnished with modern d�cor they offer a pleasing ambience. The air-conditioned rooms have television sets with satellite connection; direct dial telephone services, attached bathroom with shower and bath tub, constant supply of hot and cold water and a work desk. The restaurants at Hotel Pankaj serve you mouthwatering delicacies. Multi-cuisine dishes such as Indian, Continental and Asian are served in the restaurant called �Sandhya� which is on the fifth floor of the Hotel and offers you a panoramic view of the city. You will get to taste the delectable tastes of Kerala in Marthanda restaurant. If you wish to dine under the starlit sky enjoy the tastes that Nisha restaurant offers. Guests avail excellent wines from the well stocked bar of the hotel. Hotel Pankaj has excellent facilities. Laundry, Doctors on Call, Complimentary Breakfast, Currency Exchange, Front Desk and Travel Desk, Room Service, Luggage Storage, Conference and Banquet facilities, Free Parking and Business Centre facilities are offered to the guests. For corporate meetings and seminars, holding parties and gatherings one can avail the Hotel conference and banquet facilities. With the seating capacity of 150 people, Anantha conference is ideal for seminars, reception and parties. Vedhi is another hall with a capacity to accommodate 50 to 80 persons. Equipped with all the business related amenities such as printers, fax, internet, computer and audio visual equipments, the hotel�s conference halls are ideal for business meets. Centrally located Hotel Pankaj is close to the shopping centers. One may even visit the Kovalam Beach at a distance of 12 kms from the hotel, which is a perfect place for swimming and surfing.